it was so bright. Thank you, Cannibal, for being an awesomeness-magnet. 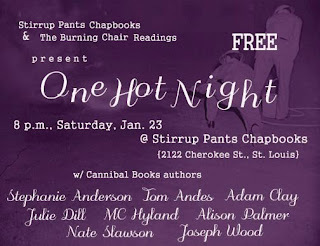 Every poet truly fluttered and flamed, and STL misses them so much now. Hearts are for breaking, we guess. Thank you, also, Joseph Wood of Tuscaloosa, for bringing your Slash Pine Press team that same afternoon to talk chap-wizardry. You ARE wizards: you built a rose inside our chests! Fresh chaps were generously left behind by Cannibal, Slash Pine, and DoubleCross - please everyone, come see these new goodies some soon Saturday!